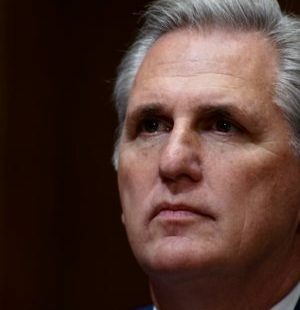 WASHINGTON — House Minority Leader Kevin McCarthy said he does not think President Donald Trump will have to declare a national emergency to get a wall built along the U.S.-Mexico border. “I believe at the end of the day we should get this done legislatively and I’m looking forward to making that happen,” McCarthy (R-Calif.) told TMN at a news conference on Wednesday, when asked if the president should bypass Congress if the bipartisan-bicameral conference committee on border security cannot reach an agreement. The 17-member panel held its first meeting last week. Today the committee reportedly received a classified briefing from border security officials. The lawmakers are tasked with coming up with a comprehensive agreement prior to Feb. 15, when funding for nine executive departments will expire. The committee was formed last month as part of an agreement to end a 35-day-long partial government shutdown. House Speaker Nancy Pelosi (D-Calif.) has ruled out the inclusion of wall money in any legislation. Trump has said that, if necessary, he will declare a national emergency to get the wall built. But the president also has said that Congress should be partly responsible for resolving the impasse over border security.